Philip Gensaya, a pupil of Contra-Mestre Barrãozinho teaches capoeira, a Brazilian martial art, in Richmond. He’s been spreading his teachings throughout the city for about four years. 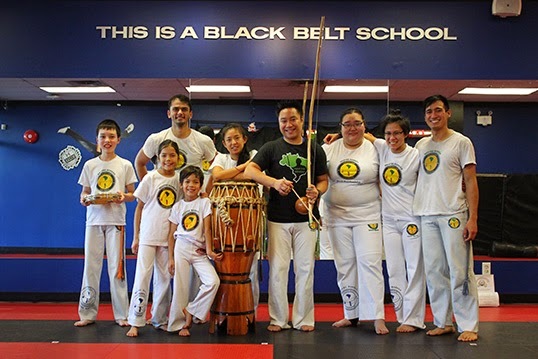 His students not only learn how to fight, but also how to play musical instruments and dance to the rhythm of Afro-Brazilian music. Capoeira, a martial art that contains rhythm and fighting, was created by African slaves in Brazil during the colonial period in the 1500s. It has a strong acrobatic component and is always played with music. Mestre Barrão, a Brazilian champion of capoeira, founded the group Axé Capoeira. In the early 90s he brought capoeira to Canada and opened his first academy. Currently, the group – whose headquarters is in Vancouver – has schools in over 30 countries and thousands of students. Mestre Barrão went back to Brazil, but his two sons Barrãozinho and Ossoduro are still in Vancouver, spreading appreciation for the capoeira art form in Canada. Barrãozinho trained Philip Gensaya and gave him the nickname “Filipino” because his parents are from the Philippines. Having grown up watching lots of ninja movies, Gensaya has always been fond of martial arts and practiced kung fu as a kid. At an early age he was introduced to capoeira, but he only decided to learn it in 2006 after watching a movie called The Protector. “There was this scene with a capoeira player fighting against the main character. I said to myself ‘Hey that’s capoeira! I want to do that,” Gensaya explains. After training for four years, Gensaya decided to teach capoeira in 2010. He got permission from his teacher to spread the martial art elsewhere, so he brought it from Vancouver to Richmond. The striking thing about capoeira is that, unlike other martial arts, music is blended together with the fighting. Knowing the dancing, how to play the instruments and singing are as important as learning the kicks. “You may be able to flip, jump and kick really fast but if you can’t play the instruments or sing you’re not well respected,” Gensaya adds. Sung in Portuguese, capoeira songs are the main way through which students learn how to speak the language. Learning Portuguese as well as Brazilian history and culture helps students to change their level and reach a higher rank. In 2011, Gensaya went to Brazil to train with his group, Axé Capoeira. He went to Recife, which is where his master grew up. There he met capoeira players from all over the world – Mexico, Russia, the United States etc. “We all went to one place in Brazil and we all played together. So it really shows that different cultures can come together and learn this martial art,” says Gensaya. 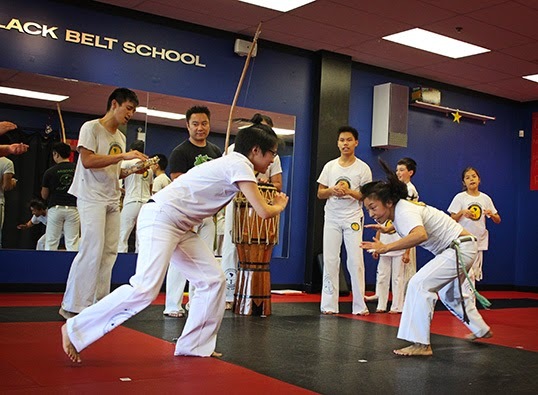 Filipino’s classes start with warmups called gingas, a swinging movement in which students slowly move to the continuous sound of capoeira music; then the moves get more complex and acrobatic. Students practice rasteira, a self-defense trick to sweep or pull the opponent’s leg. As the class progresses, they take turns playing instruments and singing in Portuguese. Chika Yamada, a visiting student from Japan, has been practicing capoeira for nine years. She started taking classes when she came to live in Canada and, although Brazilian culture differs a lot from hers, she identifies with it. “A funny thing happens to me when I hear capoeira music. I feel the urge to play and dance,” says Yamada. Daniel Remedios from India has been doing capoeira for three years. He had tried other martial arts before but found they made him angry and tense.